Spent most of the night just below Nub Peak (2,755 m or 9,039 ft) to get this shot. I like the perspective higher up as Mount Assiniboine (3,618m or 11,870ft) rightfully towers over Sunburst Peak (2,849 m or 9,347 ft) in the foreground which you don’t appreciate at the nublet far below. Was a wee bit chilly up there at night. However between a warm dinner and our portable espresso machine we were warm and awake. We were lucky to have a particularly large Mars thanks to its close 2018 approach and managed to line it up nicely with the top of Assiniboine. Made for an interesting decent with our head torches but we eventually made it back down to the tent just ahead of dawn, for a brief rest before getting up somewhat deliriously to shoot the sunrise at Magog Lake. 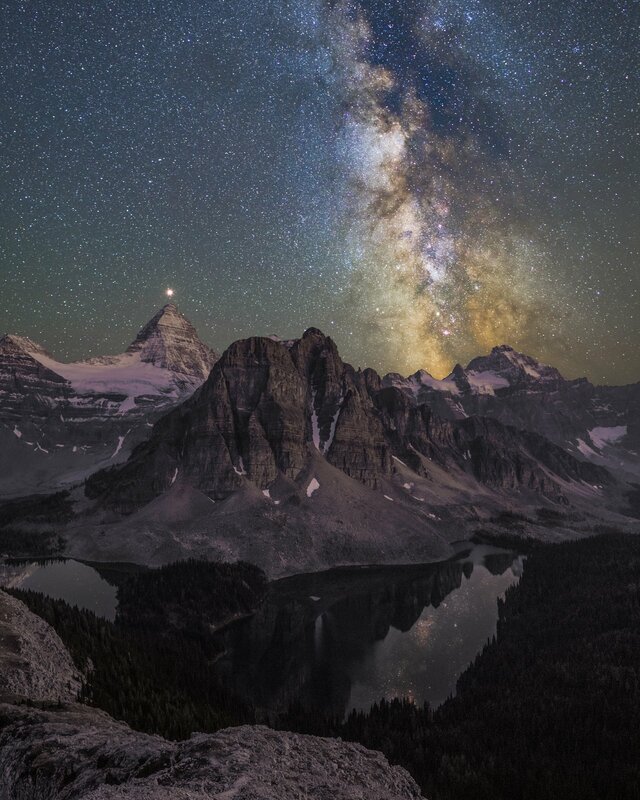 Mount Assiniboine Provincial Park, British Columbia, Canada. It doesn't look real,it is that good lol. Definitely worth the cold to get this one. Thanks mate; although I do try and make things look as realistic as possible. Astrophotography is always hard like that as the camera sensors are so much better than ones eye. Thanks. It was a fair bit of effort to get this shot so I am glad that people like it. One of the best shots i've ever seen of yours!! Amazing!! Thanks mate. It was a complex shot logistically and took a lot of physical effort to get up there and patience in the elements. Glad you like it; means a lot. Thanks. The more you get into it the more you will love astrophotography. I have a section on my portfolio dedicated to it now - https://www.robertdowniephotography.com/Astrophotography . If your interesting in learning I would suggest starting with the the information at Lonely Speck https://www.lonelyspeck.com/ ; it's an excellent resource. Holy Moly!!!! I wish I had more to upvote. This is one of the best shots I have seen in a long time!! Resteemed to my paltry band of followers!! Thanks. That is very kind of you to say that. Incredible photography. I have camped high up in the Colorado Rockies. The stars are unbelievable. Great capture! Yes. The stars in the mountains are always amazing. Lets you cut though all that particulate pollution you have down at ground level. Your UA account score is currently 4.931 which ranks you at #1203 across all Steem accounts. Your rank has dropped 1 places in the last three days (old rank 1202). In our last Algorithmic Curation Round, consisting of 380 contributions, your post is ranked at #90. Wonderful. Great setup work. You catch a unique moment! Which gear did you use? Can I find it on your website? As a general rule if you click on the little (i) in the bottom of the images on my website you can see the exif information on each photo. This was however a difficult composite shot so the exif info won't be correct. It is is a panorama of two images at 24mm merged vertically. The foreground is five shots at 30sec at f5.6 median merged as a smart object in photoshop to reduce noise, and the sky is eleven shots at 15sec stacked in Sequator (to a total of 165 seconds) at around f2. It is a Samyang f1.4 lens which has a variable aperture (its actually the Cine T1.5 version lens ). The aperture was backed off a bit, there are no fixed stops on Cine lenses so I can’t tell you exactly what the f stop was. Camera is a Canon EOS 6D mkII . Thanks for the explain. I didn't expect so many shots stitched... Even more work! Yes it is a lot of work to get a clean shot with little noise.